FIGURE2 ■ Retraction of the medial lobe with the Carter-Thomason port-closure device. The stitch is retrieved and anchored outside the abdominal wall. FIGURE3 ■ Developing the subcapsular plane with a transverse incision made back on the bladder mucosa overlying the prostate lobes in the vicinity of the bladder neck. FIGURE4 ■ The left lobe of the adenoma is being enucleated FIGURE5 ■ The adenoma enucleation is continued. using a combination of J-hook electrocautery and blunt dissection with suction cannula. ments, and two additional sutures were placed to secure the lateral pedicles of the prostate (near the bladder neck). Blood loss was 800 cc, and operative time was 3.8 hours. FIGURE 6 ■ The adenoma enucleation is completed. 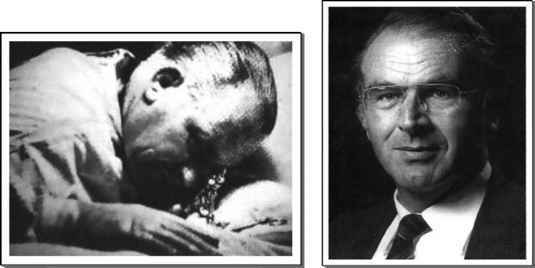 anterior incision of the prostate capsule, adenoma enucleation, and reconstruction of the posterior bladder neck and prostate capsule, is similar to the original technique described by Millin (2). In their series, mean operative time was 2.4 hours, and mean blood loss 192 cc. 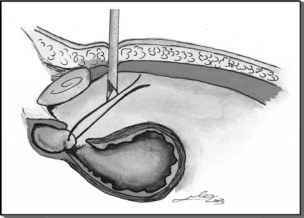 An important technical modification by the authors consists of a transverse cystotomy incision proximal to the junction between the bladder and the prostate, instead of incising the prostate capsule itself. 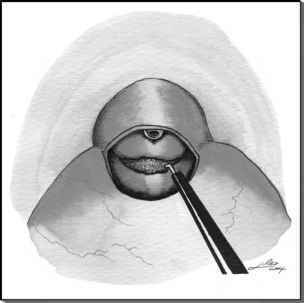 This cystotomy is created by using a harmonic scalpel or J-hook electrocautery. In our early cases, we attempted various technical maneuvers to minimize intraoperative hemorrhage, such as suture ligation of the dorsal vein complex after incising the endopelvic fascia, and extravesical suture ligation of the lateral prostate pedicles bilaterally. Later, a transverse or longitudinal anterior capsulotomy of the prostate gland was attempted. In our experience, none of these maneuvers reliably provided a bloodless field. In fact, it is now our impression that performing a capsulotomy directly over the anterior surface of the prostate gland may transgress the subcapsular venous plexus, contributing to increased blood loss. Incising the bladder neck just proximal cephalad to the prostatovesical junction to gain entry into the urinary bladder, thereafter entering the subcapsular plane posteriorly and posterolaterally, and its subsequent circumferential development is effective in decreasing blood loss. Several maneuvers had been described to facilitate the enucleation of the adenoma. Njinou Ngninkeu et al. described an extraperitoneal laparoscopic prostatic adenomectomy assisted by the index finger inserted through the abdominal wall for digital enucleation of the adenoma after the removal of the medial port and a 2-cm enlargement of the port (24). Nadler et al. used a fan retractor and laparoscopic shears to enucleate the adenoma (21). We perform the enucleation with the "Sotelo Prostatotome," a device designed by the senior author. It is similar to a curette or an osteotome and facilitates the enucleation of the adenoma during laparoscopic simple prostatectomy. 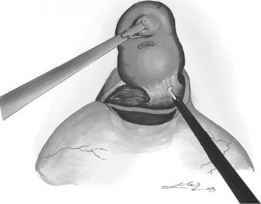 Its metallic, curvilinear tip with a sharp cold-knife on the distal side of the forceps divides the adherence between the adenoma and its capsule during circumferential dissection of the gland (Fig. 9; Tables 6 and 7).